Part of the fun when you travel is visiting the local hot-spots and experiencing the area’s unique traditions and culture. Of course, we also like to find the restaurants that serve the best local cuisine and find places where we can buy local items to bring back home. But that doesn’t mean we’re limited to dreary souvenir shops. On your next trip, how about looking for local delicacies and knick-knacks at one of America’s most famous and historic marketplaces? 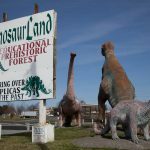 Sure, every city and town offers plenty of opportunities to purchase local goods and services, but there are some special places in America where you’ll find everything you’re looking for while experiencing local history. Ever since human beings first began to travel, there have been marketplaces to provide them respite from their journeys. The great marketplaces of America started as a way to welcome weary travelers and boost local economies, and many of them have stood the test of time to become famous tourist attractions. Most of these famous and historic markets are located on the East Coast, having grown from humble beginnings in America’s first big cities, to now being historic landmarks in their own right. These marketplaces have become trendy hangouts, with many other cities across the nation following suit and creating a bustling social and economic center for people to gather. 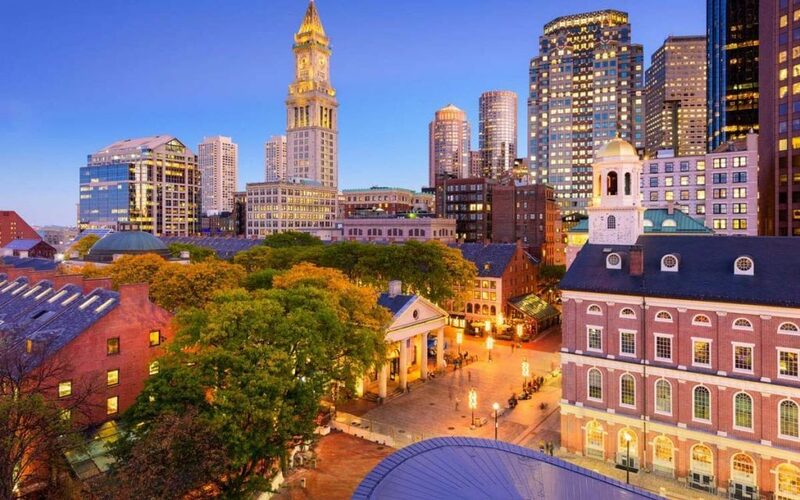 Boston, Massachusetts was one of America’s first big cities, and is rich in the history that helped create our nation. Public marketplaces were popping up all over as a way for peddlers and farmers to sell their wares, but open-air markets in big cities started falling out of favor as our nation grew. Fear of disease and crime were justified, and indoor marketplaces began to make an appearance. Even centuries ago, wealthy entrepreneurs were always on the lookout for business ventures that would make them wealthier. His plan was approved only by a slight majority at a public meeting, and construction was begun in 1740 on a design inspired by old English markets – it would have a lower market and meeting areas on the second floor. Known as Faneuil Hall (yep, of course, Pete named it after himself), it quickly became the place to be in Boston. It served the city well until a fire destroyed almost everything in 1761. Bostonians immediately rebuilt it and the hall soon played its part in the history of the Revolution as founders like Samuel Adams made fiery speeches to the townspeople, and the market survived the British occupation of Boston. Decades later, the marketplace needed to be expanded due to its popularity and would become a staple of the city’s economy. Quincy Market was completed without any taxation or debt (probably the last time this would ever happen in an American city) and was one of the largest marketplaces ever built before the twentieth century. Today, it is a favorite spot for Bostonians to purchase local produce and crafted home goods, as well as a major lunchtime hub for the city’s workers. It’s also become a must-see attraction for tourists – offering a taste of local history and modern culture all in one place. The marketplace area is protected as a historical landmark, so it shouldn’t be going anywhere anytime soon. Just like Boston, Philadelphia was one of the first major cities in the colonies, and open-air stalls and small marketplaces were a common sight from the beginning. When William Penn first established Philadelphia, one of the first priorities for the town managers was to clean up the “ragtag” of locals selling their goods all over town. It soon seemed to get a little out of control for the residents and plans were made to clean up the area of “babbling” hucksters once again. Apparently, the hucksters were loud and had a habit of running out into the street, causing chaos for carriages and later, streetcars. Something needed to be done. Thus, Philly’s famous indoor market was born, eventually becoming Reading Terminal Market. Business boomed for decades, and young boys known as “market brats” would deliver orders to residents within short distances. Later, merchants with delivery trucks would offer the precursor to online shopping – orders could be called in from all over the city and delivered within the day – for free! Even Amazon can’t say that. Today, the market is still booming with dozens of restaurants and shops selling local foodstuffs and other items perfect to take home as souvenirs. 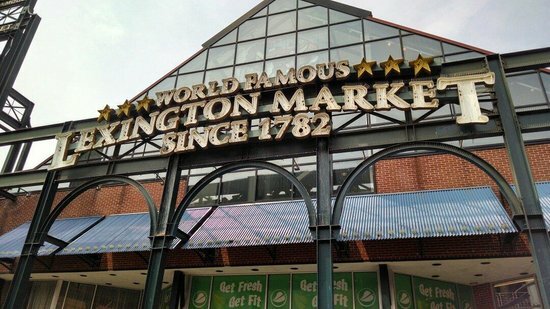 Baltimore, Maryland’s Lexington Market is the oldest marketplace in the nation in the sense that it’s still in the same location as when it was founded in 1782. It seems the people of Baltimore had an easier time creating a sustainable marketplace without complaints from residents. In fact, Baltimore’s market immediately became the busiest place in town. Wealthy merchants soon saw that the popular marketplace could benefit them and joined the farmers every morning at 2 a.m. when the opening bell rang. Now townspeople could buy livestock, farm equipment, and home goods. The market became a catalyst for growth in the town which soon made Baltimore an official city – the nation’s second-largest city at the time. Turnpikes and railroads would also make Baltimore the stopping point between Harrisburg, Pennsylvania and Richmond, Virginia — and everyone stopped to “refuel” at Lexington Market. It is said people would travel for days to purchase quality meats, dairy, and produce, as well as handcrafted items like socks, scarves, and gloves. Ralph Waldo Emerson commented that Baltimore was the “Gastronomic Capital of the World” after his first visit. You can’t beat a compliment like that. Lexington Market is still famous for its amazing food and quality products and continues to be a bustling hub in the city. You can read all about it in this Proud American Traveler review here. A very strange advertising ploy pays off. While there are plenty of great city markets on the East Coast, one on the West Coast stands out as the most well-known and well-visited. Pike Place Market in Seattle, Washington was founded in 1907 as a way for the locals there to meet the farmers, butchers, and fishermen who provided their food to local shops. The tradition continues to this day with a “meet the producer” mentality with stalls run by local farm owners and shopkeepers bringing fresh seafood, meats, produce, and handmade crafts like jewelry to its somewhat hipster community. Surprisingly, the most visited area of the market is Pike Place Fish Market, but it wasn’t always the success that it is today. The fish market was founded later on in 1930 as fishermen continued the generations-old tradition of bringing their fresh catch to shore for immediate sale. But by the late 1980s, the fish market was close to bankruptcy. Enter perhaps the most unique advertising campaign ever invented to generate business – throwing fish. The market’s then-owner may have been under the influence of something, or maybe he was just sleep-deprived from the stress of his financial worries. We may never know how or why, but he came up with the idea of throwing the most slippery and smelliest of products around in front of customers, and it was a hit. Pike Place Fish Market is now a tourist destination in itself. Employees learn the skill of properly throwing fish to each other and putting on interactive performances that draw incredible crowds. But whatever the circumstances, the fish market is now a “world famous” destination that brings in thousands of visitors every day, which in turn helps draw customers to the other restaurants and shops at the market. And be sure you stop by and see the market’s unofficial mascot, Rachel the Piggy Bank. She is a working – albeit rather larger than normal – piggy bank whose cache of coins is used for improvements to the market. If you rub Rachel’s nose and feed her with some change, it is said to bring you good luck. 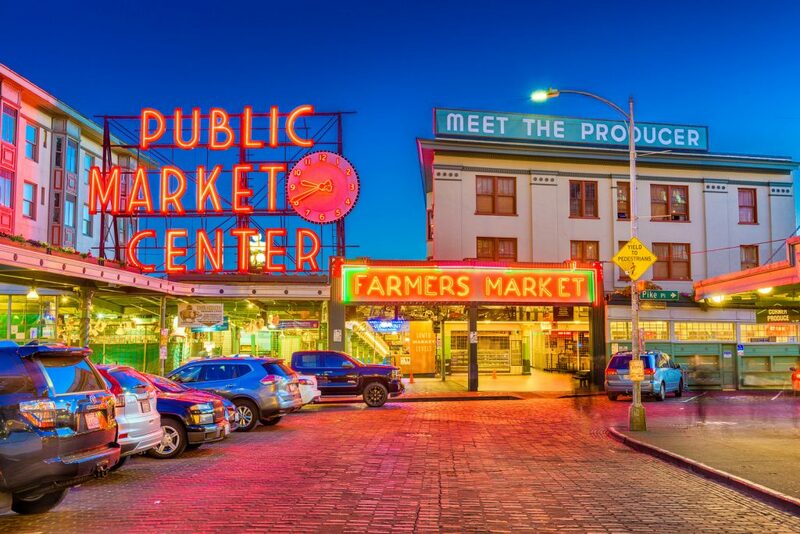 Like the other markets on our list, Pike Place has become an economic and social epicenter in the city, and you can’t visit Seattle without checking it out for yourself. There is almost always a variety of live music, street performances, and seasonal concerts to enjoy while you sample some of the favorite local goods sold by the shopkeepers. And finally, don’t forget the obligatory selfie in front of the famous Pike Place Market sign so you can post it on social media! America’s famous marketplaces are a part of our nation’s history that often attracted travelers who decided to stay permanently, which helped build the economy and increase the population in the cities where they still stand with pride. They are all unique and offer the best opportunity to experience America’s history and culture in one spot, so be sure to visit a historic city marketplace the next time you travel. Do you have a favorite American city marketplace? Leave us your comments.